The first thing you notice when you reach the Northwest, step off the bus and take a deep breath is just that – you’re taking a deep breath. The rhythm of life here is more calm and tranquil—it’s a region far enough from the hyper-urban porteña capital, that suddenly it seems possible to sit back and enjoy the heat from the sun’s rays. Located the northwest of Argentina, this region is nestled against Bolivia to the north and Chile to the west. 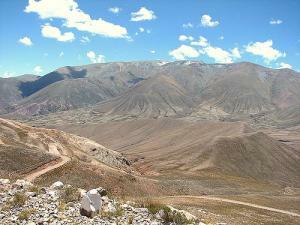 Although a large part of the region remains in the lowlands, the altiplano begins in the Quebrada de Humahuaca, as you move closer to Bolivia. The border with Chile is determined by the continental divide at the summit of the Andes; driving west, you’ll have to pass altitudes of over 4000 meters before you reach the Atacama desert of northern Chile. 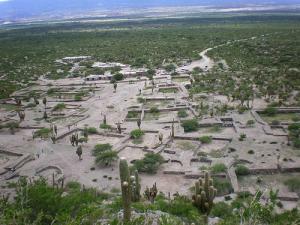 Towards the east are the semi-desert regions of Chaco, Formosa and Santiago del Estero, where there are few major cities and few attractions. However, as you pass through these regions by bus, keep your eyes open – the landscape is beautiful despite its monotony, and it’s always fun to see herds of goats along the side of the road. 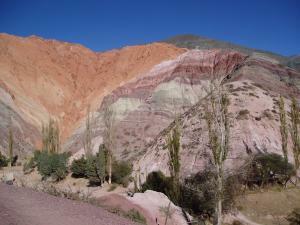 Going south, you arrive at the spectacular National Parks of Talampaya in the province of La Rioja, and the Valle de la Luna in the province of San Juan. The northwest is decidedly Andean, and the proximity of Bolivia is increasingly obvious as you go north. The best way to enjoy a trip through this region is to submit to its pace. Don’t expect to find a store open in the afternoon around here. Though each town has its own schedule, in general, noon marks the beginning of siesta time. Each town will slowly reveal a distinct character to the traveler willing to take a siesta and chat with the locals whose accent also seems to have been taken over by the tranquility. No matter your pace of travel, a trip through this region of cactus-filled deserts, arid plains, mountains, canyons, and jungle-like yungas holds a number of treasures to discover. There are a variety of archeological ruins and national parks, and the three major cities of San Miguel de Tucumán, Salta, and San Salvador de Jujuy each have churches, plazas and monuments that are well worth the detour. The Quebrada de Humahuaca, on the road between San Salvador de Jujuy and the Bolivian border, is a geological break that shows all the colors of the rainbows on a mountainside peppered with cacti and llamas, and one can’t help but wonder why it wasn’t declared World Heritage Center by the UNESCO before 2003. The region has been passed through by trade and travelers for more than 10,000 years, connecting the Andes with the plains and today it is the scene of growing tourism, a modern trade of travelers in a region of breathtaking beauty. This page rendered in 0.102 seconds.